Home / Articles / What Causes Sudden Tooth Sensitivity? Have you ever been eating or drinking something and out of the blue had a sudden sharp pain in one of your teeth? This happens to a lot of people and often without any warning. The shock can be sudden and surprising and leave us wondering exactly what has gone wrong in our mouth to cause the sensitivity. There are many reasons for sensitive teeth such as heat, cold, sweetness, or acidic foods. The majority of them involve a slow build-up to some sort of condition that has damaged the tooth or gum. However, there is an obvious reason that a tooth might have become sensitive quite suddenly. If you have suffered a recent injury to your mouth then tooth enamel may have become damaged. It is also possible that the gum may have become damaged and exposed the root of the tooth or there is an element of tooth decay. In either case, the tooth may now be sensitive to sensations such as temperature or sweetness. 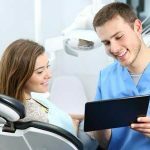 If you have had a recent injury to your mouth and also develop sensitivity than you should visit your dentist as soon as possible to evaluate the extent of the damage and make sure anything that has been broken is fixed in a timely fashion. Allowing an injury to sit without any treatment may lead to more complicated surgery down the road, so it never hurts to just have them checked. Teeth can become sensitive to sensation when the enamel has been worn down. Teeth comprise several layers of which enamel is the outermost. Underneath the enamel is a layer of dentin and then the pulp, which is tied into the nerve system. Once the enamel has been worn away there is almost no barrier between the nerve and the exterior of the tooth. The dentin layer serves to transfer sensation from the enamel to the nerve, so if dentin is exposed it is pretty much a direct line to the nerve. There are several ways in which the enamel can be broken down or worn away. The most obvious is a crack or a cavity. These reach all the way through the enamel and can get to either the dentin or even all the way to the pulp. Usually, if either of these is the cause of sensitive teeth, then there will also be a lingering and throbbing pain. 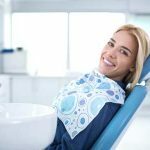 If you are having sensitivity that is also accompanied by lingering or throbbing pain then you need to visit your dentist as soon as possible to make sure that you do not have an untreated cavity or cracked tooth. Another way that enamel can be worn away is through the grinding of the teeth. Many people grind their teeth at night while they are asleep. This is a condition called bruxism. Most people do not realize they have bruxism until they start experiencing the painful side effects or someone tells them that they have been grinding their teeth in their sleep. An easy way to treat bruxism is by getting a night guard. This is an appliance that can either be provided by the dentist or purchased from a drugstore. The drugstore version is much cheaper and can be molded to any set of teeth by simply boiling it in water to soften it up, and then molding it around the upper teeth. Once a night guard has been created one can simply place it in their mouth every evening before bedtime. The guard puts a thick layer of cushioning in place between the top and bottom jaw to absorb all of the shocks that may occur as one grinds their teeth in their sleep. This will prevent the enamel from being further worn down and can help relieve symptoms that have already appeared, such as sensitivity. If you find this uncomfortable there are other possible ways to treat your teeth grinding at night. 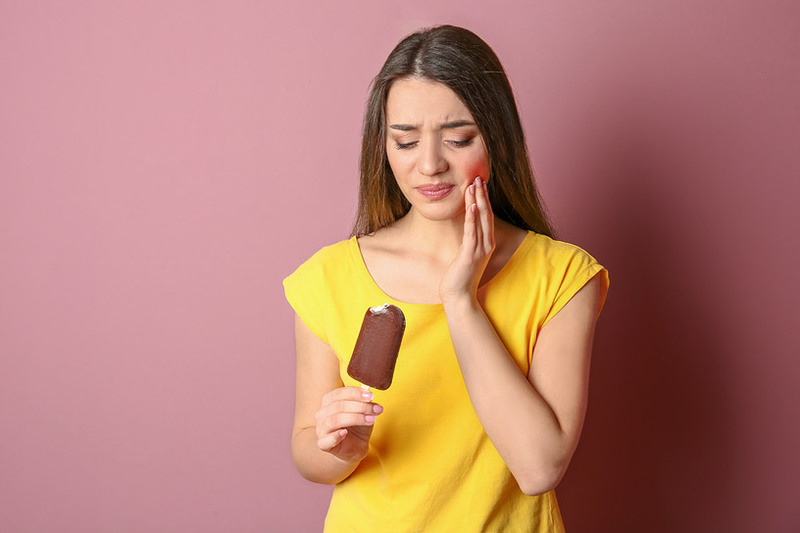 If someone has developed tooth sensitivity but their dentist has not found any major damage such as a crack or a cavity, then the dentist will probably recommend both a night guard and a sensitivity toothpaste. The night guard recommendation is because a dentist cannot tell you in their office whether or not you are grinding your teeth at night. Therefore, this is more of a speculative troubleshooting measure. A sensitivity toothpaste is used to help deaden the sensation that may be causing pain spikes when consuming hot, cold, sweet, or acidic food or drink. The dentin that is exposed when enamel is worn away is comprised of many microscopic tubes that deliver sensation to the nerve in the pulp. Sensitivity toothpaste builds up a covering which helps to buffer and deaden these tubes so that the feedback is not delivered to the nerve. Another reason that teeth may be sensitive to sensation is due to exposure of the root of the tooth at the gumline. Your gums can develop and progress through a series of gum disease based on the level of neglect that they are subject to. The first level of this disease is called gingivitis. 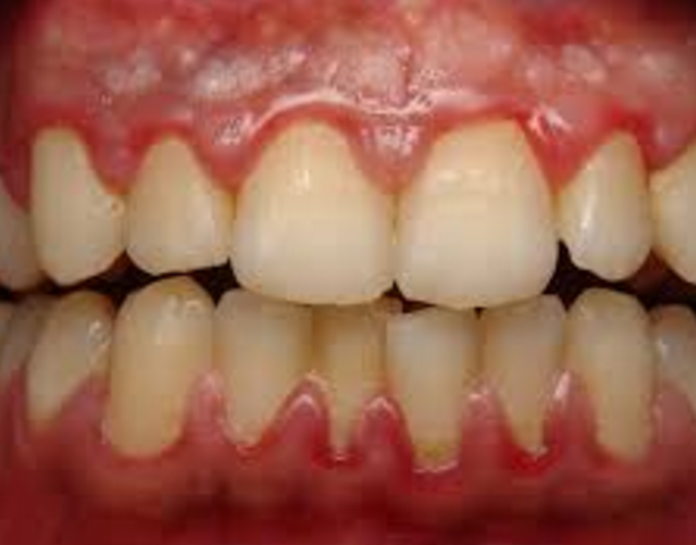 With gingivitis, your gums can become inflamed and irritated and start receding. This begins to expose the roots of the teeth. The root is easily irritated by sensation, so if you have noticed some recession this may be the cause of your sensitivity. 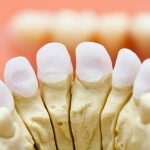 If gum disease has advanced to a more serious form called periodontitis then the gums may start pulling away from the tooth entirely and leave even more of the root or even the bone exposed. In these cases, it is extremely difficult to avoid aggravating the tooth whenever any substance enters the mouth. Usually, the only fix for this situation is some form of dental surgery. Though it sounds very serious, gum disease can be easily prevented by brushing, flossing, and using mouthwash twice a day as recommended by your dentist. 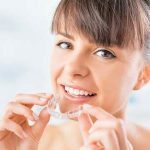 If you go to your dentist on a regular basis for checkups then they will also notice if conditions in your mouth are progressing in a negative fashion. Usually, any condition in your mouth, such as cavities or gum disease, takes a while to progress so your dentist should be able to capture these things early on if you are visiting them regularly. Even if you have just visited it is still possible for tooth sensitivity to come on suddenly from a more chronic condition. Take care of your teeth and wear a night guard and you should be well protected.